If you're like me, you've struggled finding a good homemade hot fudge recipe without corn syrup for ice cream. Yes, I know, we shouldn't be eating this too much, since it's full of sugar. 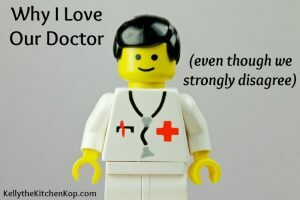 We don't have it a LOT, but it's a fun treat sometimes, and even though sugar isn't good for us, at least it's not the nasty high fructose corn syrup in the kinds you find at the store. 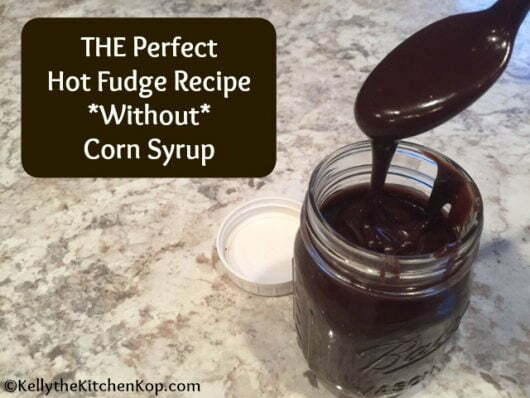 Not only that, but it's also not made with corn syrup, which most homemade hot fudge recipes call for. 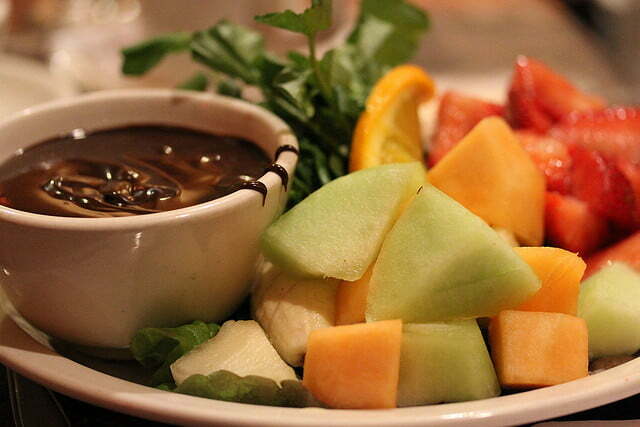 This yummy hot fudge pairs well with your favorite in-season fruit or homemade ice cream. In a small saucepan, melt butter and chocolate on low heat so it doesn't burn. In another medium sized saucepan, whisk the other ingredients together over medium heat — keep stirring as it comes to a low boil and it'll start to thicken after it boils for a minute or two. Remove from heat and whisk in the melted chocolate. Now, good luck with your self-control! Remember to either make your own ice cream (fun once in a while), or be sure to buy better quality ice cream at the store, with VERY few ingredients. Important note: we only get plain chocolate, strawberry or vanilla – that's your only chance at finding some with short ingredient labels, and even then it's tricky. Anything else is full of ingredients I can't pronounce and/or I don't know what most of them are. How to make real whipped cream — yum! This was absolutely delicious! I also encountered the issue of it hardening on the ice cream. Liquid separated while cooking – I think it was the butter, which we drizzled on top of the ice cream and hot, hard fudge. Very tasty! How did you know, perfect! Not sure if I did something wrong, but when I made this hot fudge sauce it turned hard on our ice cream and it made it very challenging to eat. Still tasted yummy but not easy to eat at all. I’m sorry that happened. When we make it and put it on ice cream it gets more firm on the cold ice cream, but not hard. Oh yum! That sounds soo good. 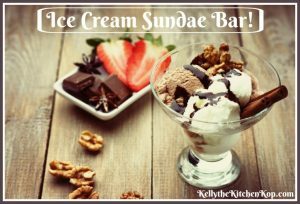 we love homemade icecream too and this would be awesome! Helen, I feel your pain! Live, love, eat, you made me wonder, there must be a zillion other ways to use this recipe besides on ice cream…anybody? I'm blank. Kelly p.s. Hi Lana, Lisa, & Sherry, I'm glad you popped in! Everything sounds so good even though I am not the biggest ice cream eater. But I do like making whip cream from scratch too. Happy TMTT!! Oh, yum! I’m trying to do more recipes without corn syrup. I’m going to have to try this one. Thanks for the idea. Remember, the TMTT giveaway is next week. I don’t want you to miss it. Sonia, I found the ice cream maker on Amazon. Very good price. Thanks again. Let us know when you try the stevia version. Thank you Sonia, Thank you Kelly! 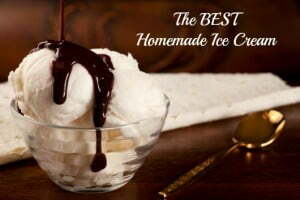 I think I will look into getting the cuisinart ice cream maker you have, and the recipes sound great. Looking forward to some real ice cream! I’ll let you know how it goes. I have recently started making my own ice cream and find it so much better than anything I have ever had. Even the simplest, fastest recipes are light years above anything I have ever had before. 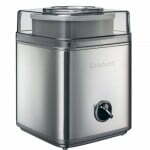 I have a Cuisinart Classic Ice Cream and Sorbet Maker (ICE-25 Series), which doesn’t require rock salt or other fussing. 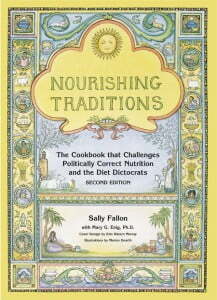 I have used primarily the recipes from the book provided from the recipe book that came with the machine. I especially love the easy one below, adding my own yummy ingredients a few minutes from the end. **I am looking forward to trying Stevia in my ice cream this summer, to see how it turns out. Whisk together milk and sugar until dissolved. 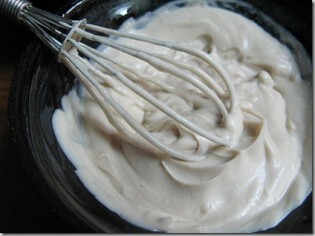 Stir in heavy cream and vanilla. Place in ice cream maker immediately (or keep well-chilled until able to) and let mix for 20-25 minutes. Combine strawberries, lemon juice, and 1/2 cup sugar. Stir gently and let macerate in juices for 2 hours or more. Strain, reserving juice. Mash berries to desired consistency. Whisk together milk and remaining sugar. Stir in cream and vanilla. Let mix about 20-25 minutes in ice cream maker, adding berries and juice during last 5 minutes. My mouth is watering! Do you by any chance make your own ice cream? If so, what sort of ice cream make do you use, and do you have an ice cream recipe you’d be willing to share. Summer is coming, here in NH our method of air conditioning is eating ice cream!